I know ya'll know (and LOVE) Etsy. I sure as hell do! This Holiday Season they have a pop up shop in NYC! Lucky for me, I live here so I can take a peek. There was a HUGE variety of items, from letter press to clothes, hand drawn cards to bike racks, they had it all! Etsy bought the entire inventory of the store from the sellers, which is fantastic. At the Etsy Holiday Shop Website, you can see all the items they chose! What lucky chaps they are! The sellers items were organized and labeled with the sellers name AND there was a card for each item with all the info, so you could go around collecting, look up the item and seller. It was just plain awesome. 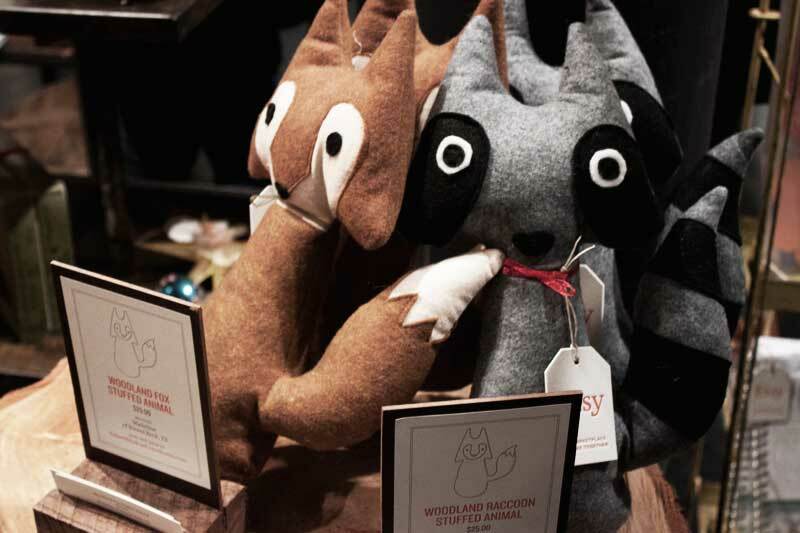 My personal fav were these adorable Fox and Raccoon stuffed animals by TidwellHollowFriends. The real reason I went to the Etsy Holiday Shop Friday night was for Designer's Debate Club. Any opportunity to be surrounded which so many amazing designers, I'll take... The motion to be debated in this Oxford Style Debate was "Lean start-up methods prevent designers from solving big-picture design problems." The moderator was Cameron Koczon, founder at Fictive Kin & Brooklyn Beta. Arguing for the motion were Anthony Casalena- Founder & CEO of Squarespace, Randy Hunt- Creative Director of Etsy & Jill Nassbaum- Executive Director of Product & Interaction Design at The Barbarian Group. Arguing against the motion were Kim Bost- Sr. Product Designer at Etsy and also Freelances at Pentagram, Aaron Carambula- Creator of Friends of Type amongst many other things & Mike Karnj- CEO and Co-Founder of Skillshare. (WOW THAT WAS A MOUTHFUL!) Although both sides made incredibly valid points (I was torn the whole time) the AGAINST side, arguing for lean design, launch and learn, showing Twitter and Apple as examples, won it out. As a Squarespace user (and lover) I had a hard time siding with the against side, I do agree with the point they were making, but as a non-web designer, I use Squarespace and find it a great tool. BUT on the flip side, the amount of glitches that could effect a larger number of people because of the larger launches is quite alarming. All-in-all, it was incredibly interesting and enjoyable (they served wine and cookies for goodness-sake!) and I can't wait to go to the next one. I am going to look further into some pros and cons on the debated subject and figure out what side I'm really on. What are your thoughts on lean design preventing designers from solving big-picture problems?